Come and explore the world through creative projects! Invite your school-age friends to exciting activities all about Space. Heidi Hensel-Buntrock, UW 4-H Advisor, will be presenting these fun and rewarding science activities on Wednesdays at 4:30 March 27th through April 17. There is no cost for the programs and all materials are provided. If you want to have more "Space" experiences, join us this Summer, starting Monday mornings, June 17th at 10:30 am through July 22nd. 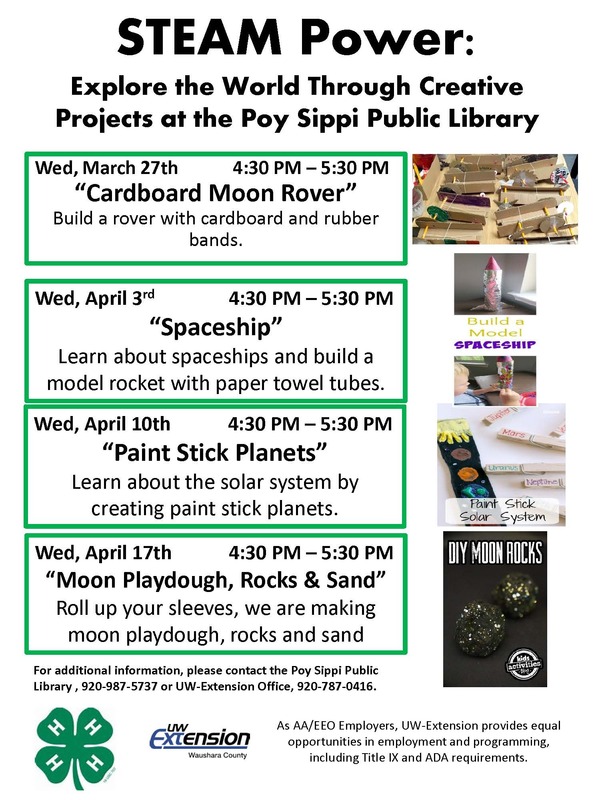 Some of the highlights include: Learning how to assemble a weather station and predict the weather with MSgt T. Williamson, USAF, assembling Planetary Pasta Rovers with Heidi Hensel-Buntrock, painting shaving cream galazies, color-spectum planets and much more.